©1997-2012, Active Network, Inc. All Rights Reserved. During the past few months Activewin has been a leader in presenting our readers with the most up to date features and improvements that Windows 2000 has to offer. We are proud to present you all with our full and complete review on the just released Windows 2000 Professional Operating System. Some may believe Windows 2000 is the successor of Windows 98SE. The fact is that Windows 2000 is the replacement for Microsoft's Windows NT business and network platform. 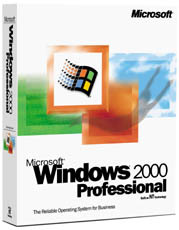 Windows 2000 is a full operating system based on a full NT 32 bit engine that allows high end multi tasking, high security levels, and advanced networking features while still supporting DirectX and all the latest hardware. Protects core system files from being overwritten by application installs. In the event a file is overwritten, Windows File Protection will replace that file with the correct version. By safeguarding system files in this manner, Windows 2000 mitigates many common system failures found in earlier versions of Windows. Provides safeguards, assuring users that device drivers have not been tampered with and reducing the risk of users installing non-certified drivers. Minimizes the chance of application failures and unplanned reboots. Works with the Windows Installer Service, helping users install, configure, track, upgrade, and remove software programs correctly, minimizing the risk of user error and possible loss of productivity. Provides assurance that applications have met a comprehensive set of standards developed by Microsoft in cooperation with customers and third party developers. Eliminates most scenarios that forced users to reboot in Windows NT 4.0 and Windows 9x. Many software installations also will not require reboots. Helps administrators clone computer configurations, systems, and applications, resulting in simpler, faster, and more cost-effective deployment. Provides a graphical wizard that guides administrators in designing installation scripts. Permits an operating system installation across the network (including SysPrep images). RIS helps users save time and reduces deployment costs by allowing administrators to standardize settings to match organizational requirements. Although RIS requires Windows 2000 Server, it does not need to be installed on each client computer. Changes the user interface, permitting you to create, read, and edit documents in a number of languages easily. Provides 25 percent faster performance than Windows 9x on systems with 64 megabytes (MB) or more of memory. Uses a full 32-bit architecture, allowing users to run more programs and perform more tasks at the same time than Windows 95 or Windows 98. Supports up to 4 gigabytes (GB) of RAM and up to two symmetric multiprocessors. Enables Windows 2000 Professional to interoperate with earlier versions of Windows on a peer-to-peer level, allowing all resource sharing such as folders, printers, and peripherals. Provides new interoperability enhancements for integrating both Windows NT 4.0 and Windows 2000 into existing UNIX environments. Services for UNIX 1.0 provides a gateway for the Network File System (NFS) on Windows NT Server and Windows 2000 Server. Adapts the Start menu to the way you work by showing the applications you use most often. Assists users in configuring, optimizing, and troubleshooting numerous Windows 2000 functionalities, resulting in greater productivity, fewer help desk calls, and better customer service. Lets you view a snapshot of a multimedia file in Windows Explorer before actually opening the file. Makes it easier to perform routine or challenging tasks, resulting in fewer help desk calls and better customer service. For example, the Add Printer Wizard makes it easy to connect to local and network printers even when you're browsing the Web. Permits only authenticated users to access system resources. The security model includes components to control who accesses objects (such as files and shared printers), the actions an individual can take on an object, and the events that are audited. Encrypts each file with a randomly generated key. The encryption and decryption processes are transparent to the user. Helps protect data transmitted across a network. IPSec is an important part of providing security for virtual private networks (VPNs), which allow organizations to transmit data securely over the Internet. Provides industry-standard and high-strength authentication with fast, single logon to Windows 2000-based enterprise resources. Kerberos is an Internet-standard, which makes it especially effective for networks consisting of different operating systems such as UNIX. Integrates smart card capabilities into the operating system. Smart cards enhance software-only solutions such as client authentication, interactive logon, code signing, and secure e-mail. Provides a centralized and consistent environment for management tools. Provides a command-line console, allowing you to start and stop services, format drives, read and write data on a local drive, and perform many other administrative tasks. Provides a standardized infrastructure for monitoring and managing system resources, allowing system administrators to monitor and control the system via scripting and 3rd party applications. Gives users enhanced access to their information and software. IntelliMirrorTM management technologies greatly benefit mobile computer users by letting their computer resources "follow" them regardless of where they log on to the network. Offline files, a feature of Intellimirror, lets users keep working on key documents even if the network connection fails. Intellimirror requires Windows 2000 Server. Allows you to boot your system at the most basic level using default settings and minimum device drivers. Permits administrators to define customized rules about virtually every facet of a user's computer environment such as security, user rights, desktop settings, applications, and resources, minimizing the likelihood of misconfiguration. Group Policy works in conjunction with the Active DirectoryTM service and requires Windows 2000 Server. Turns off your computer and monitor after a pre-determined time, while retaining your desktop on disk. This allows the system to be completely powered down. When you re-activate your computer, hibernate mode restores your programs and settings exactly as you left them. Lets you disconnect from the network and work as if you were still connected. The Offline Files feature lets you mirror documents stored on the network to your computer. Makes entire Web pages with graphics available for viewing offline. You can view Web pages on your notebook computer when you don’t have a network or Internet connection. Lets you compare and update your offline files and folders with those on the network. Lets you dock or undock your notebook computer without changing hardware configuration or rebooting. Guide you through steps for setting up remote access to a network or virtual private network (VPN). NetMeeting Lets you hold an international meeting without traveling. With NetMeeting® conferencing software you can collaborate in real-time using video teleconferencing, shared applications and file exchange. Lets you connect and disconnect a wide array of peripherals such as joy sticks, scanners, and camcorders without configuring or rebooting your desktop or laptop. Provides secure, wireless communications between two Windows 2000-based computers using the popular infrared protocol. Provides a higher-bandwidth connection for devices that require faster data transfer. Supports removable storage devices such as DVD and Device Bay. Show your work with high-quality graphics with support for new display devices such as Accelerated Graphics Port (AGP), multiple video cards and monitors, OpenGL 1.2, DirectX® 7.0 API, and Video Port Extensions. Lets you automatically install new hardware with only minimal configuration. More than 6,500 devices now support this functionality. Provides Internet Explorer 5.01, integrating your desktop environment with the Web. Support for Dynamic HTML Behaviors and XML gives developers the broadest range of options--with the fastest development time. Helps you quickly search for different types of information, such as Web pages or people's addresses. And choose which search engine you want to use--all from one location. Helps you find your way back to sites you viewed in the past. The History bar not only tracks Web sites, but also intranet sites, network servers, and local folders. Helps you find and organize relevant information whether it's stored in files, folders, and Web sites. Enables system administrators to deploy Internet Explorer 5.01 across platforms quickly and efficiently, installing only the components and custom applications they choose--all from one central location. Remembers where you've been by completing a URL as you type the first several characters into the address bar. Alleviates the tedium of filling out forms on the Web by automatically entering your name, address, or other information that you've securely stored on your computer. Automatically corrects mistakes on common URL conventions such as http, .com, and .org. Automatically locates a proxy server and configures Internet Explorer 5.01 to connect to the Internet through that server. Connects your home network or small office network to the Internet, using a dial-up or broadband connection. From a single computer, you can provide network address translation, addressing, and name resolution services for all computers on your home network.